Can you believe it is December already ?! With our annual CAWA Xmas BBQ at Point Walter Reserve fast approaching I would like to remind you to get into action and RSVP no later than Tuesday 9th December. You get to boulder and have dinner waiting for you, now how can you pass up that opportunity. We would like to invite you to the annual CAWA Xmas BBQ at Point Walter Reserve in Bicton. It’s a great opportunity to catch up with people you haven’t seen for a while. Take advantage of the pristine waterside bouldering and have dinner waiting for you afterwards. Every climber’s dream! Activities: Bouldering and eating – we will also take a slackline or two. 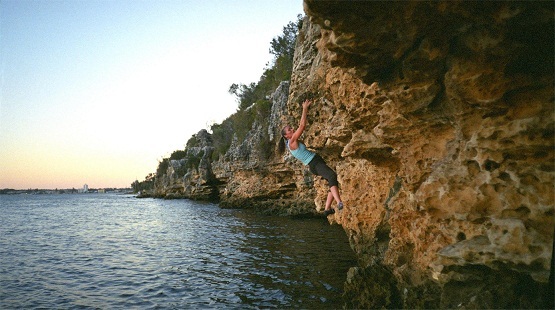 The plan: 4.30 pm – 6:30 pm Blackwall Reach bouldering (or whenever it suits you). BBQ: 6:30 pm Post BBQ: Freo pub for those who would like to venture out for the night. What CAWA will supply: Nibbles, meat, salad, buns, sauce, plates and plastic cutlery. What to bring: Drinks, anything else you want to eat, chairs, blankets, mozzie repellent, climbing shoes and chalk bag. If you have gear for ball games like cricket, soccer or volleyball please bring it along to provide alternate fun for those not bouldering. Directions: Come down Honour Rd on the left side of Pt Walter Reserve, going straight through the roundabout at Carroll Drive and continuing on past the tennis courts. On your right you will see a kid’s playground some parking and BBQ’s that are quite close to the road. We will be in that general area, fairly close to the road. On your left, if you follow the path down to the water, you will find a long expanse of limestone wall conveniently placed for your bouldering pleasure. Cost: Free for members (please bring your membership card). $10 non-members (or you can join up on the CAWA website before the day). RSVP: Essential for catering purposes. Please let us know Tuesday 9th December 2014. Email melissak@climberswa.asn.au. If anyone has specific dietary requirements (e.g. vegetarian) please tell us.